For your aseptic weighing needs, SCAIME is one of the few suppliers to offer EHEDG-certified hygienic load cells. Today, professionals in the agri-food sector are obliged to meet an increasing number of food safety requirements. In a highly competitive market, compliance with hygiene standards is an essential element for the reputation of an agri-food company among its customers. EHEDG certification for a load cell confirms its aseptic and hygienic design: it attests to the effectiveness of the clean-in-place (CIP) process, without additional protection of the sensor. Sterilisation in place (SIP) will eliminate all contamination by microorganisms. When you choose a hygienic and aseptic load cell, your installation will be able to meet the strictest requirements in terms of food hygiene. The hygienic design of an EHEDG-certified load cell ensures its cleanability and eliminates the need for the protective elements (covers, seals, etc.) which are normally essential. 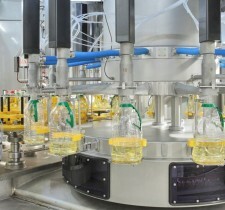 It also enables reduction of cleaning cycle times, thereby ensuring optimal consumption of water and cleaning products. Filling operations will be faster and more precise, and machinery stoppage times will be shorter.